There’s a place in my house where I stand around, a lot. If you have kids you can probably guess where that is…yes, the kitchen. Nobody ever told me how much kids eat. They didn’t have to because I remember how much I ate too. And I remember my mom always being in the kitchen. What I don’t remember, is my mom standing around in the kitchen scrolling through her iPhone. Oh wait, that’s because they didn’t have those back then! You see, my guilty pleasure from all this hard, constant work in the kitchen are the few minutes in between tasks that I stand there, at my kitchen counter scrolling though my phone. It’s mindless scrolling, really. It isn’t for a purpose, and what I am looking at isn’t harmless, but really? Standing at my counter, scrolling through a phone is not the life giving kind of thing I want to be spending minutes of my hours on earth doing. Many moons ago, when I was in college training to be a teacher, I took this behavior management class. And the thing I remember most about changing a person’s behavior was giving that person a REPLACEMENT behavior. If you don’t replace the negative behavior (the one you want to get rid of) with a replacement behavior (a more positive behavior to replace the old one) then that person is not very likely to change at all. I am committing to no more standing around scrolling. 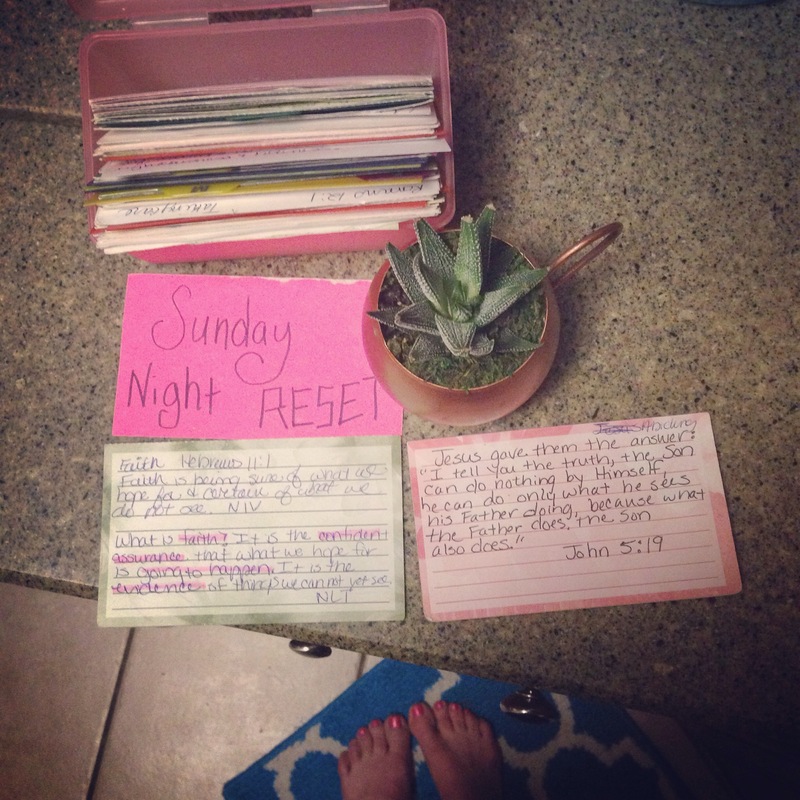 I have this box of lots of index cards with scripture written on them that I have placed on my counter. This week I am going to be spending time grabbing these cards and reviewing these verses instead of moving my finger along the screen of that phone. I am just wondering, what is an area in your life you would like to hit the “Reset” button on this week? Does anyone else find themselves scrolling mindlessly through their phone and want to stop? What replacement behavior would work for you? I am looking forward to jumping into John Chapter 5 tomorrow. I hope you are too! « Can I Really Change?